Time flies and it's already Halloween in two short days! I may not be very big on Halloween but it's good to get into the spirit a little bit with some pumpkin carving, trick-or-treating, and a few fun treats. I find that as the kids get older, the fervor behind Halloween is quieting down so maybe I should try to enjoy it as much as possible while my son is still dressing up and excited to "boo" his friends and neighbors. The kids at school are having a Halloween bake sale today and I made these simple peppermint brownies for the sale. I considered making a batch of owl cupcakes but when I saw this simple idea for making Halloween "faces" using peppermint patties on brownies from Martha, it seemed like an easy/tasty project to try. I love an excuse to make brownies! I took Martha's idea and made it even simpler. I actually used a recipe from Joy of Baking that makes brownies that are meant to be somewhere between cakey and fudgy. I wanted a moist brownie and also one that would hold up well. Since I made sure to take my brownies out of the oven earlier rather than later, mine turned out more fudgy, which is how we like them. Instead of embedding a peppermint patty into the brownies (as well as using one for the faces) as per Martha's recipe, I just added a little peppermint extract into the batter to reinforce the flavor, keeping things simple and not too crazy minty. I don't know if everyone's a fan of peppermint brownies but my son loves it and selfishly, of course, I was thinking of him. He wanted a batch for himself and after I let him sample one, he really wanted to keep the entire batch. In other words, these are my kid-approved! Somehow, I did manage to pack up most of the brownies and they now reside with many other creepy and not-so-creepy treats awaiting the school bake sale. Have a fun and safe Halloween! Once Monday rolls around, it's officially time to talk Thanksgiving and Christmas, and I can hardly wait! After making various sweet cream puffs with pate a choux dough, I thought I'd make a switch to savory. I went with that classic American flavor combination of cheddar cheese and bacon. Not very surprisingly, the fellas in my house are big fans of this flavor combo (around here, cheers ring out when I make twice baked potatoes with bacon, cheddar, and scallions) so I knew I'd have some ready taste-testers for this. I baked a handful for lunch the other day and froze the rest of the batch for another time. The ones I baked were readily polished off. These little mounds of sharp, cheesy, savory goodness are pretty easy to love. They're ever so crisp yet tender on the inside. To make, it all starts with the familiar pate a choux dough. I added a pinch of paprika for a little extra color and you could really flavor it with a touch of whatever spice you want. The dough is quickly cooked on the stovetop and after the eggs are fully incorporated and the dough is ready, the savory part comes in. I added shredded sharp cheddar cheese and a few slices of finely chopped bacon. You could add some chives or scallions if you have it on hand. This had me thinking back and remembering that I've actually made cheese gougeres before, years ago. One Christmas, I attempted them for a family Christmas party. What I remember was how bland those puffs turned out! For whatever reason that I can't remember now, I'd substituted a mild cheese for whatever it was I was supposed to use and I remember those gougeres had hardly any flavor as a result. Well, I'm happy to say I made up for the flavor department this time. And speaking of Christmas, the holidays are coming up! That has me thinking of parties...appetizers, toasts, and nibbles. These are just the kind of little bites that would be great for a cocktail party, or they'd just make a nice appetizer to get a party started. 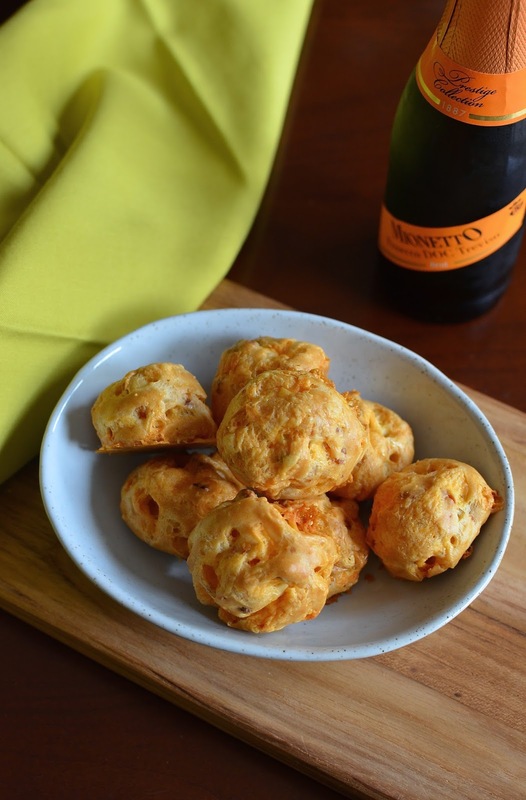 These cheese gougeres would certainly go well with some bubbly (anybody else love the combination of salty potato chips with champagne?). I like to keep mini bottles of prosecco in my fridge for mimosas or whenever we might want to make a little toast to life. The next time I bake off the rest of this batch of cheddar-bacon gougeres, I'll be reaching for one of those bottles. I wanted to make some treats for a couple of good friends the other day. One of them recently moved back after three years across the pond so we were excited to be able to meet back up again like we used to. I decided to bake whole wheat chocolate chip cookies (one of my favorite recipes) and these raspberry oatmeal bars. I think I was the main beneficiary of this bake because the house just smelled amazing as these bars baked and cooled! Just think...butter, brown sugar, toasted oats, and candied raspberry all swirling together in the warm air. It was intoxicating and I was honestly content to just enjoy that aroma. This was easy and fun to make. 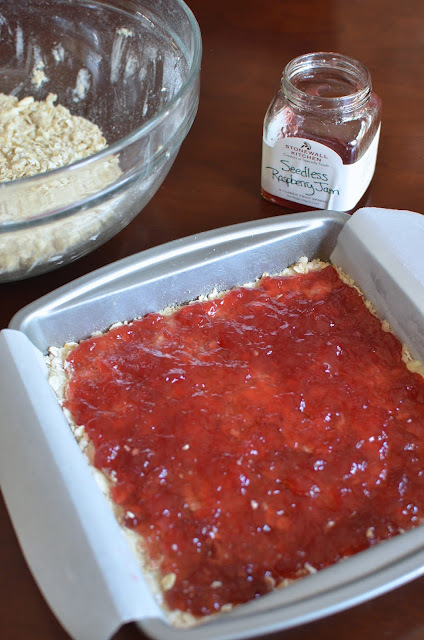 I took the Pioneer Woman's strawberry oatmeal bars but used raspberry jam instead. I popped open a jar of Stonewall Kitchen's seedless raspberry jam - one of the things I picked up from their main company store in York, Maine when we visited a while back. Shopping in that bright cheerful store was a whole lot of fun! There are just basic ingredients and components making up these raspberry oatmeal bars. Take a big bowl and stir together flour, oats, brown sugar, and a couple of other dry ingredients, then cut in butter. This becomes the base and top layer of the bars while a layer of the raspberry jam goes in between. Pop it in the oven and magically, you have this aromatic, sweet and buttery treat. The darker, crusty golden edges were my favorite part. I baked the bars in a 9-inch pan instead of the 9x13 suggested in the recipe because they looked thin in the larger pan and I noticed a couple of comments about a smaller pan working better. I don't know about you but I prefer some height in a bar. I settled for my 9-inch square pan and I'm glad I did because the bars ultimately ended up being about 1-inch thick and that was just what I was looking for. There's a lot of sweetness going on here so it's a real treat. 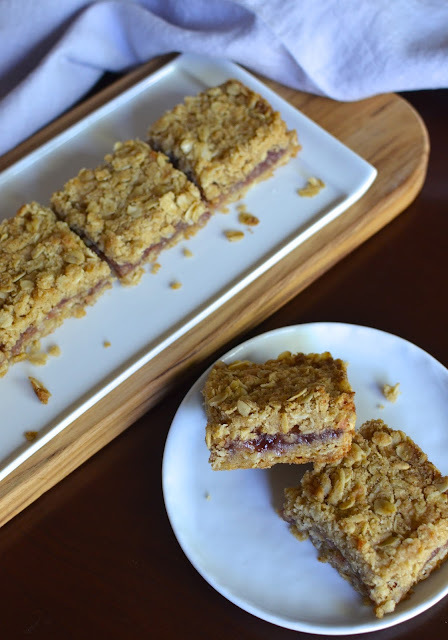 I love the old-fashioned oats giving the bars plenty of chew and substance while the raspberry jam just livens things up. 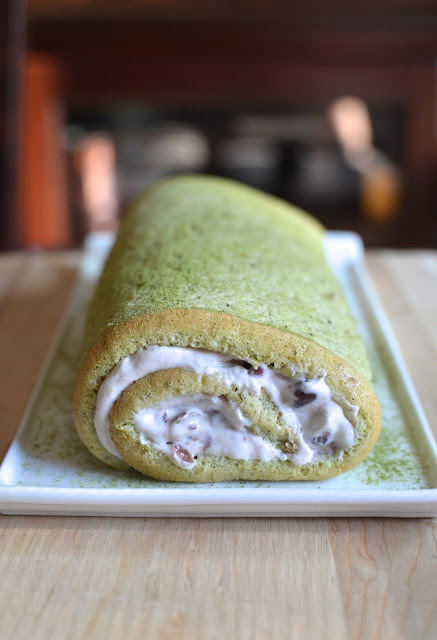 This is the dessert I served during last weekend's pasta night, a matcha-almond roll cake with a sweet red bean cream filling. My sister loves green tea desserts and my husband has been a big fan of this cake so I thought I'd whip up another version of it again. So I'm once again circling back to the matcha-almond sponge (it's that good). I made the layer cake twice and each time, I was thinking it would be interesting to try and turn it into a roll cake. The soft, spongy, and super-moist texture of the cake makes me think of roulades and I just had to give it a try. Instead of a chocolate cream filling, I went with the Asian theme and made a sweet red bean filling. The combination of green tea with sweetened red beans (azuki) is very common and popular in Asian desserts (from ice cream to red bean paste fillings for buns and cakes, which I adore). You can simply buy prepared sweetened red beans like I did and fold it into some freshly whipped cream. Need I mention that I'd never made a roll cake before? It's probably pretty obvious. And should I also say that this might not have been the best first-time experiment since this particular cake is likely more fragile (almond meal adds a great taste and texture but it makes the cake all the more moist) than your typical roll cake recipe? Excuses aside, I think I had acceptable success with turning this cake into a rolled one. Ironically, despite all my worries about how thin and fragile the cake is and how it might stick to the towel, my "downfall" was actually not positioning the cake onto the towel properly so that I had to double fold the towel at the top before the first fold, which resulted in the towel "cutting" into the cake and breaking it in one section. There was some sticking but that was manageable. If only I had placed the cake in the right position at the top of the tea towel! But hey, 'don't let perfection be the enemy of the good', right? I seem to tell myself that a lot. And when all's said and done (as well as filled and rolled), I think things worked out just fine. The cake plates were wiped clean and we had a great time over dinner. I think dessert just round out a meal and gives it the perfect little sweet finale. At this point, I've settled into the swing of Fall. It's already October! Things change so fast - we go from sizzling summer days to yellowing leaves seemingly overnight. There's such a huge difference between the whirlwind and buzz of summer and the quietness of Fall. Each has its own merits and I'm actually happy to transition from one to the other, appreciating each in different ways. So I think it's time to settle down with soup again. Soup is something I make and enjoy all through the year but when the weather drops, I really start to crave it and think about making it more regularly. Recently, I made a creamy but creamless cauliflower soup, that's finished with a spoonful of tahini. It's a recipe I picked up from a book I read a while back, called Lunch in Paris (it's got a familiar theme of a woman's transition into a new life in Paris; there are many of these books and this was one of the more enjoyable ones I've read). It's really ever so simple to make, as soups often turn out to be, making you question why you ever pay unreasonable prices for it outside. There are just four basic ingredients in this soup: cauliflower, onion, chicken stock, and a bit of tahini/sesame paste stirred in as a finishing touch to add some richness and that little something in the background. The soup comes out practically snow white (I seasoned it with white pepper). I topped mine with some toasted pine nuts but you could go with other options like chopped chives, a pinch of paprika, toasted garlic slices, sesame seeds, poppy seeds or maybe some cashews. The soup may look at little bland and boring but I was scraping my bowl clean with this one. 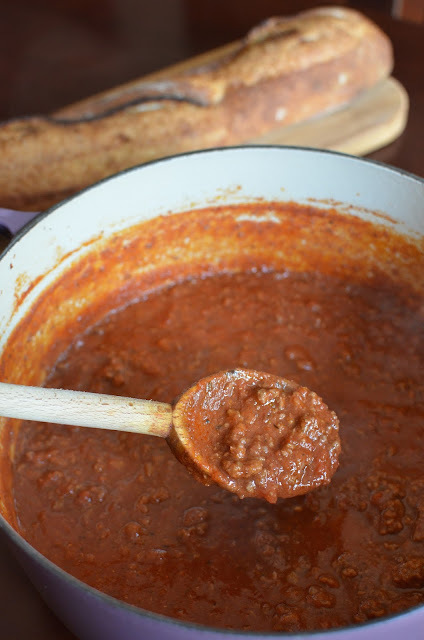 Sometimes, the basics are all you need for something delicious and comforting. I love the sweetness from the onion, the background of chicken stock anchoring the flavor, and the texture and thickness from the cauliflower, which is cooked down and finally pureed into this velvety soup. This is the time of year when I start pulling out my immersion blender and I'm very grateful to have this handy tool to make soups like this one!